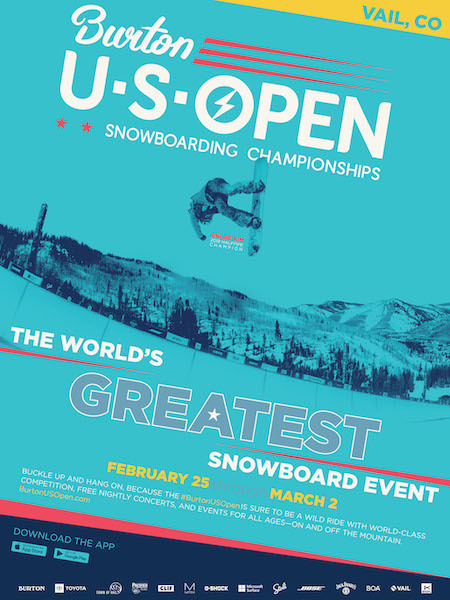 Burlington, VT (January 31, 2019) —Burton Snowboards announces the return of the 37th annual U·S·OPEN Snowboarding Championships to Vail Mountain February 25 through March 2, 2019. This is the premier event of the competitive snowboarding season featuring the world’s most progressive riders competing at the top of their game for a chance at the $373,000 prize purse and to become part of history at the legendary Burton U·S·OPEN. Also, new this year is the opportunity for attendees to become competitors in a fun Banked Slalom race open to participants of all abilities Thursday through Saturday from 10:00 am – 12:00 pm and 1:00 pm – 3:00 pm. In addition to being able to compare your times to that of the pros, the top finisher in both men’s and women’s category will receive a prize on the Solaris concert stage. All participants in the demo and the Banked Slalom race will also receive a token redeemable for select prizes in the Burton Sponsor Village. The excitement of the Burton U·S·OPEN continues in the Town of Vail with the live Burton Concert Series with musical acts set to perform on the Solaris outdoor concert stage, at the Shakedown Sessions presented by Jack Daniels and at the Dobson Ice arena (full entertainment announcement coming soon!). Attendees can also join in the fun at participating bars and restaurants throughout Vail Village including The Fitz, Pazzo’s Pizza, and Garfinkel’s offering daily Après All Day food and drinks specials, live broadcasts of the slopestyle and halfpipe events, plus giveaways and contests. Additional activities include product sampling, demos and giveaways in the sponsor village at Golden Peak; exclusive U·S·OPEN gear at the Burton Pop Up Shop at the base of the slopestyle course, in the Burton stores at Vail Village and Lionshead and at Burton.com; plus the annual Chill fundraiser, the Dobson closing party and much more! The world’s best snowboarders will come together in Vail, Colorado from Feb 27 – March 2, 2019 to partake in the longest running, premier snowboarding event, the Burton U·S·OPEN Snowboarding Championships. By day, experience world-class halfpipe and slopestyle competition, then at night keep the momentum high with FREE concerts, events and activities for all-ages. Next post: Did American Media Just Buy TEN?